Breast cancer is a terrible disease that has affected millions of lives worldwide. Many survivors have taken their struggles as an opportunity to step forward and offer their support to those who are still battling breast cancer. We have chosen to recognize two such local women as our Hometown Heroes for the month of October. Jeanine is a Burlington resident who was diagnosed with breast cancer in 2009. Shortly after her diagnosis, while running down the beach, Jeanine came across some abandoned houses and was inspired with the thought of creating a cancer recovery center at the beach by using little houses just like those she saw painted pink. After more thought and prayer, Little Pink Houses of Hope was born. LPHOH was founded with the belief that healing is not just about taking care of these enemy cells in your body, but about finding completeness in your life. It is run by volunteers and funded completely through donations. LPHOH sends breast cancer patients and their families on beach vacations at no cost. During their week-long vacation, families enjoy free meals and take part in unique and exciting experiences, such as hang gliding, yachting, and kayaking. The goal is for these families to take a break from the stress of their daily lives, doctor visits, and medications and to spend some relaxing time together as a family, which many times can be the best medicine. The work of this national foundation has touched the lives of those across the United States as well as Canada, but has a strong influence right here at home in Alamance County. Jeanine was recently honored by SELF magazine as the winner of the 2014 Women Doing Good award. 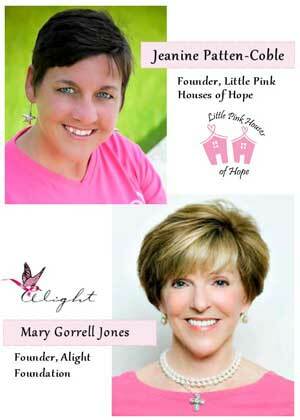 Following her breast cancer diagnosis and successful battle, Mary founded the Alight Foundation in 2005, which is a group that is dedicated to newly diagnosed breast cancer patients right here in the Piedmont Triad area. The foundation strives to provide adequate financial, emotional, and educational resources so patients can be better informed about treatment options and what to expect. In addition, she wanted to make sure each patient and their family had a support network to help them through the difficult times ahead. Mary’s desire was to help ease the fear, panic, and disbelief of new patients so they could focus on the business of healing. Mary has been involved in many projects, such as The Button Chair exhibit, which is a tribute to women in North Carolina who have battled breast cancer and features thousands of buttons, each belonging to a victim or survivor of the disease. Alight Foundation has also contributed millions of dollars to fund the opening of a new cancer center at Moses Cone Hospital. Currently, Alight Foundation works with the Cone Heath Care Center to donate a specially published book to newly diagnosed patients called “The Journey,” as well as the Alight Emergency Assistance Fund, for patients who need financial assistance to receive treatment. The main goal of this program is for every breast cancer patient to realize: you are not alone in your fight. These amazing women took their breast cancer diagnosis, fought against their cancer and won, which in itself takes amazing strength and courage. Then they used their experience as an opportunity to touch the lives of thousands of people whom they have never even met. Thank you, Jeanine and Mary, for your strength, your dedication, and your inspiring stories. We wish you many years of continued success.